11 cars (5 Turbo’s), 18 people and an early morning start! The Turbo Register hosted the last ‘Early Morning Run’ for 2018 and it was a fantastic day. Clear skies and traffic free. We travelled some beautiful country roads on a glorious morning to arrive at the Tylden Junction Café for breakfast. A great group of members (old and new… welcome David & Christian Di Palma), some regulars and some ‘Early Morning Run’ first timers all enjoyed a great chat, a great drive and a great breakfast. Lots of tales told over breakfast, many laughs and the general commentary of things ‘Porsche’. Dennis Moon (compensation for only having been given 1 of the 2 pages of his driving notes on the morning). The Early Morning Runs are a popular event. Whether it’s the crackle of the exhaust at an un-godly hour, the clear roads, the people or that cup of coffee & breakfast with friends – it works! Here’s hoping you can get along to one next year. Thirty-two attendees, three children, 17 Porsches and a sunny Sunday… take these ingredients and you’ve got what made the Turbo Register run to St Andrews Beach Brewery such a success. 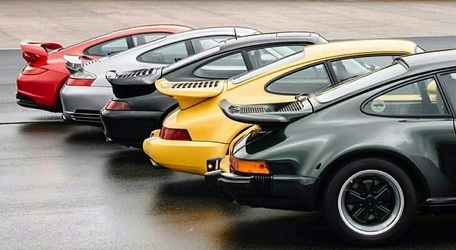 Ten Turbo’s presented with a role-call to excite any Porsche enthusiast….. three 930s, a 993, two 996s, two 997s and not one but TWO 2018 GT2RS’! Our drive took us out to Remuce Café in Bittern, then onto the St Andrews Beach Brewery in Fingal, on the Mornington Peninsula. Great drive, great food and best of all great company. It was a very social event, with David Hosking securing special areas in each venue to cope with the racket we were inevitably going to generate. Hot chocolate, coffee, tea, scones & toast at the Remuce Café, followed by a group photo then lunch at St Andrews Beach Brewery… where the casual setting and fare of appetizers, pizza, chicken, fries and sliders was highly appreciated. There’s one run left on the calendar and it’s an Early Morning Run on the 14th October (details soon). Don’t miss out. Be there! The Turbo Register’s first Early Morning Run of the year took place on the 20th May and judging from the comments on the day – it was a tremendous success. David Hosking (Co-Captain of the Turbo Register) did a tremendous job in securing the invitation to this wonderful motoring museum. This gem is hidden away in Beaconsfield and relatively unknown to all but car-club members. David secured Sunday (20th May) in conjunction with the EH Holden club. What a sight! … a mingling of Porsches and EH Holdens gingerly making their way along a couple of hundred metres of dirt road to the museum. The parking lot was a blend of good Ol’ Aussie and modern German engineering. The owner of the museum, Terry Dowell, gave an off-hand description of most every motoring exhibit. His appreciation of every car for its ingenuity of design, originality or provenance was inspiring. Everything was valuable – but everything was driven. Yes, it had a purpose which he was true to. He attends as many rallies as he can through the year. The list of cars on exhibit was incredible. Auburn-Cords, including a Cord previously owned by Amelia Earhart in the most fantastic shade of blue, one of only a hand-full of original RHD Thunderbirds bought new by none other than Johnny O’Keefe, Paul Newman’s Lincoln Continental…. Then there was the prototype Holden, and one of the last high-performance Holdens to run-off the production line, Buicks, Chevrolets, Ford Tourers, Packards*, a Rolls Royce, and my favourite – the Tucker Torpedo. The Tucker Torpedo – a flat-six, rear-mounted (which, naturally would appeal)-helicopter engine no less, shatter-proof windscreens designed to pop-out on collision, roll-bar, steering box located behind the front axle for passenger protection…. The list goes on, and this was 1948! Further to this wing of the museum is an outer wing, which boasts Peter Brocks first ‘paddock-basher’, his ‘hill-climber’, and the Torana he won his first Australian Touring Car Championship in. A fantastic day with a lovely drive through the Belgrave hills, and a great breakfast at ‘Primary at Pioneers Park’ in Berwick to kick-off the morning. Please join us for our next run on the 5th of August – details out soon! ……life is too short to be normally aspirated! *One of the Packards had a plaque on the drivers side dash, which stated “this car reached a speed of 110.8mph prior to shipment” …..Those were the days when Quality Control was fun!